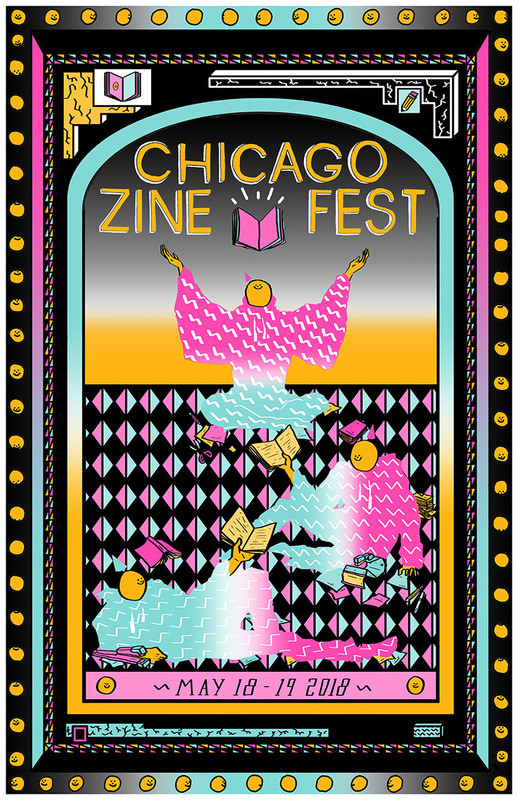 When I arrived at this year’s Chicago Zine Fest (CZF), the first thing I did was make a zine. 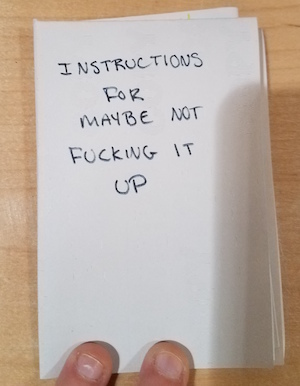 It’s been a difficult year thus far, and I have to confess, I haven’t been thinking about zines much. I meant to get back to them, to seek out new zinesters review more work, and make something of my own, but in the flood of stressors I’ve struggled to re-focus. However, the first workshop up on the balcony in Plumber’s Union Hall was a collage zine-making workshop by Ag47, a non-profit that strives to uplift femme creators by pairing young artists with adult mentors. Their current project is very cool and modern: they are hosting workshops in which participants create zines containing words of advice for their past and future selves, and plan to geocache them at various locations around the city. I was still buzzing a little from unexpected social anxiety when I sat down and began folding, cutting, and thinking about my mess of a past self, but the small act of making a mini made that drift away. The cover of my mini for Ag47. As I walked around zine fest afterward, it became easier and easier to remember that I love these weird, almost undefinable things because they always clearly come from real, unique people. There is so much raw emotion and raw love in each one that they can’t be disconnected from their makers, and can create empathetic experiences in a way traditionally published media does not. 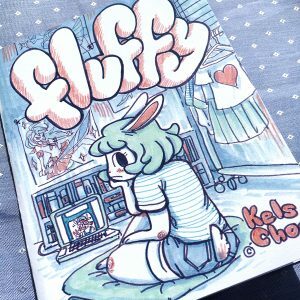 With this in mind, the following is a list of artists I discovered at 2018’s CZF, and hope you can discover or rediscover. Not all of them have work available for purchase online, although most do, but what I hope to do is connect people to people through the work they create. I stopped at Kelsey Choo’s table because it was one the cutest tables on the festival floor. Her website gives a good indication of her color sense: Choo floods her work with bright, welcoming shades of pink, blue and green, and not just to make things cute. Check out these cool scientific illustrations, which become strangely vibrant and eerie when filled with color! Her Infinite Corpse contribution panels demonstrate how she uses color to create fantastic worlds filled with magic and possibility. 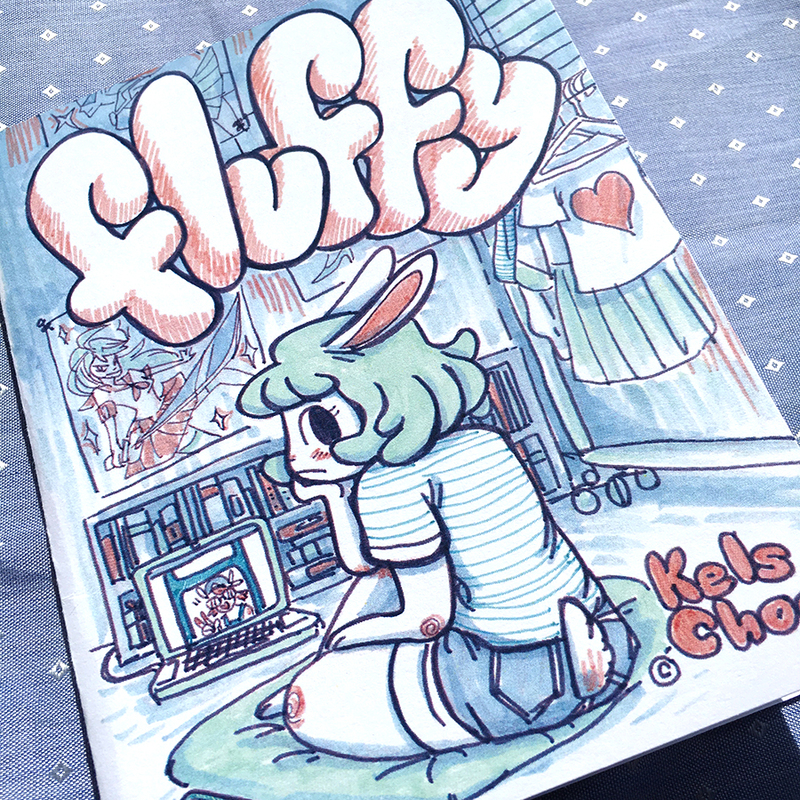 I picked up The Three Goddesses zine, which doesn’t appear to be available online at the moment, but much of her other work is, including Fluffy, a comic about the struggles of being cute. Speaking of colors, goodness was I excited to find Andrea Bell! There’s a strong sense of order and balance in Bell’s comics; the line work is tight and careful, and her lettering is very neat. 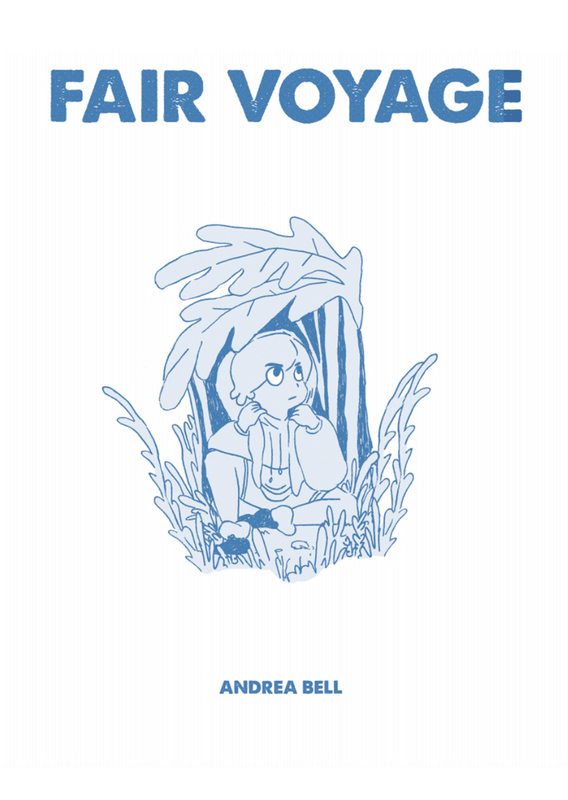 This orderly style lends itself well to a works like Still Waiting, a little comic about healing and loss that Bell explained is purposefully small so that readers can carry it around and have it when they need it. Her fantasy stories are also very character-focused; Witch Cap, a mini zine not currently available on her website, follows a young witch going on a coming-of-age journey to find her cap and realize her full potential, not just as a magical being but as a person. 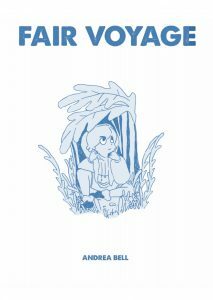 Fair Voyage, an adventure comic about two girls working to unseat the despot who dethroned and killed the elves meant to rule, spends a good deal of time letting the girls be snarky teens with Opinions about music and fashion. Read about these adventure girls and others yourself by checking out her storenvy. I first encountered Patrick Cheng’s comics when I bought the Kitty’s Guide mini zines from him at last year, in which his humanoid cat proxy reviews coffee shops around Chicago. Cheng is an animator, and his work unsurprisingly feels animated. The characters move with a liveliness not all cartoonists can achieve, and Cheng is a master of punchlines. 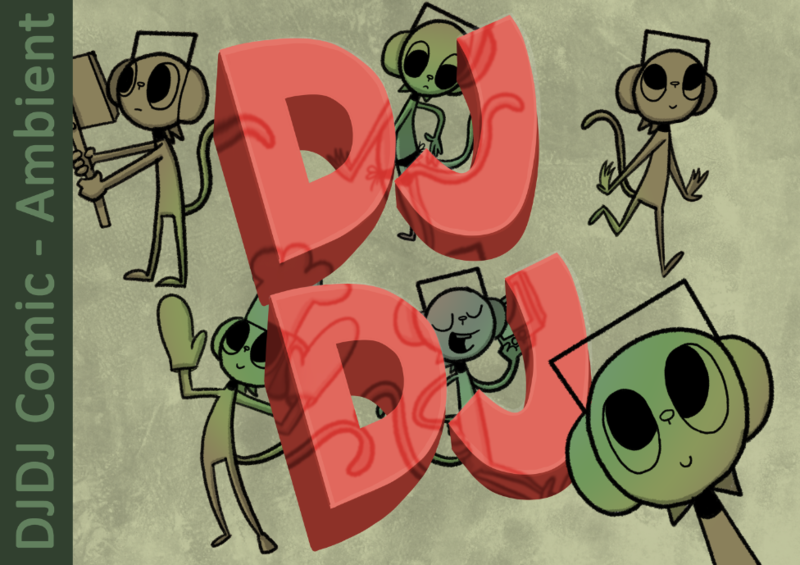 His latest zine, DJ DJ, is a wordless, silly set of vignettes about a cat creature named DJ DJ. In a particularly well-crafted bit, DJ DJ lathers himself up in the shower only to end up walking out with a soap lather suit. I sometimes pick up lots of emotionally heavy zines, and light-hearted work like Cheng’s is a great pick-me-up in-between serious perzines. 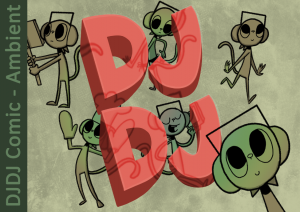 Check out his work at his website and pick up DJDJ on gumroad. Did I mention that I love zines that are all about Big Feelings? Unlike with Choo’s table, which was covered in brightly colored, cute things that activated my “oooh shiny” sense, I was drawn to Shirley’s because I spotted the cover of 4 Months. This small zine is mostly illustrations, framed by a page of short text on either end, leaving it largely open for interpretation and raw emotion. I like works like this because I don’t necessarily have to explain them in words, as I’m doing now. I can try my best to dig into the emotions behind each drawing, trying to catch the shape of the feeling that inspired it. Our Conversation About the Monster has a similar effect, but uses more text – specifically, only the dialogue of a conversation with no background or context given – and blue washes of color imposed on black and white patterned paper. The spaces between sentences communicate a myriad of possible feelings; they let the reader know that one speaker is perhaps hiding experiences that are intense and difficult to communicate. It’s striking, and an exercise in empathy through unconventional art. Treat yourself and check out Shirley’s work ASAP. I’m not an artist so maybe this is a totally common practice that all artists have heard of, but are y’all familiar with scribble drawings?! 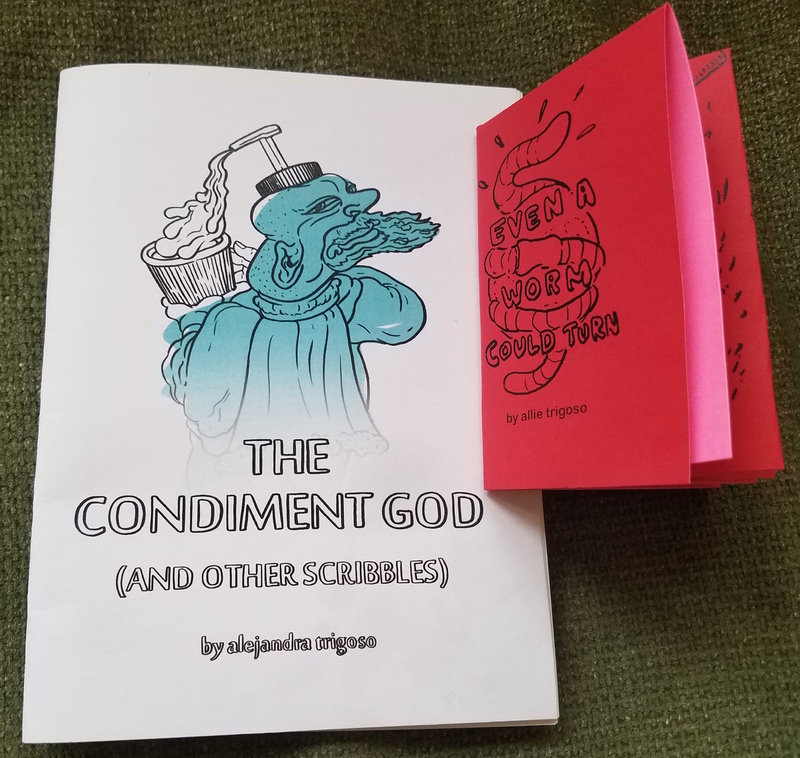 As Trigoso’s zine The Condiment God (and other scribbles) explains, to create one you first scribble a random shape and then use it as your guide to turn it into whatever comes to mind! The Condiment God is a delightful little zine full of such drawings that reveal the wealth of creativity, humor and passion for absurd character creation living in the artist’s brain. Trigoso also has a mini called Even the Worm Could Turn which is humorous and wildly imaginative. In addition to positing that worms could totally destroy civilization if they take the right tactics, Trigoso slips an extra joke inside of the mini, which you discover if you unfold it and open it up. I LOVE when zinesters play with handmade zines like this; with a simple creation Trigoso has wormed their way into my heart. You can sneak a peek at some scribble drawings on Trigoso’s tumblr, and message them to have your own included in a future zine! 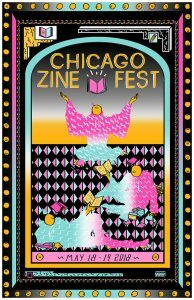 If you’re feeling inspired by all these incredible creators from Chicago Zine Fest, make a zine and send it to us for review! We want to continue to explore zines and their unique empathy-creating abilities, and are always open for more zine reviews. Don’t forget to check out further zine and DIY-related coverage at the BHP blog.